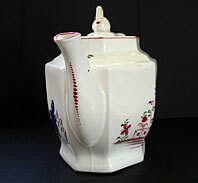 "A rare antique Staffordshire porcelain octagonal teapot with distinctive swan finial lid. 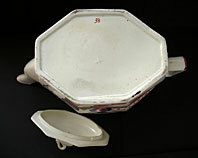 It dates from circa 1795 to 1805 and has a glassy hard paste porcelain body. The curious fence and blue rocks pattern is reminiscent of delftware and is found on pieces by several contemporary porcelain manufacturers. Here the maker has given this pattern an early - number 38. Attribution is difficult but Miles Mason, A.E. Keeling (Factory X) and New Hall are all possibilities. A wonderful rare piece for the expert collector that looks stunning on display and is worthy of further research." Antiques Expert Hamilton Bear. Dimensions: width 235 mm max. height 155 mm max. Marks: Painted pattern number to base and impressed raised 'X' mark. Condition: In great display condition and a good surviving example. 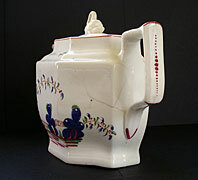 Condition Report: There are a number of darkened hairline cracks to the teapot body caused by hot water damage when the pot was in use. The pot is however both sound and robust. 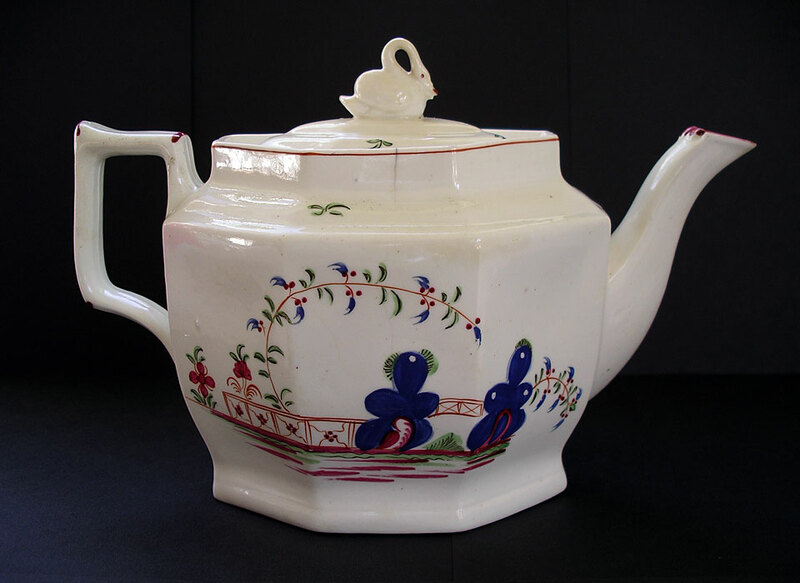 The end of the spout has been professionally restored to a high standard which is easily missed - only detectable on close scrutiny with a magnifying glass, Two small chips to the underside edge and flange of the teapot lid.